For scanning microarray slides we are currently using an Agilent Microarray Scanner, microarray images are then analyzed and data extracted using Feature Extraction. Microarray data are analyzed using the Partek Genomics Suite. BioAnalyzer (Agilent): Lab-on-a-chip platform providing improved accuracy and reproducibility analysis of DNA, RNA, proteins and cells. NanoDrop: Spectrophotometer for highly accurate analyses of 1 microliter samples of nucleic acids. Sequence Detection System (SDS) TaqMan 7700 and TaqMan 7500 (Applied Biosystems): 96-wells plate real-time PCR instruments. StepOne (Applied Biosystems): 48-wells real-time PCR instrument. SmartCyclers (Cepheid): Random access real-time PCR instruments. Microlab Duo (Hamilton): Pipetting robot. Genios (Tecan): Multi-detection microplate reader for DNA quantification (Fluorescence, Absorbance or Luminescence). 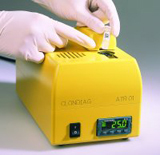 Clondiag ATR 01: Array Tube Reader. Agilent G2539: High resolution microarray scanner. 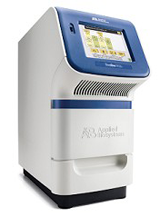 ABI 3130xl: Automated 16 capillaries DNA sequencer. Illumina-Solexa Genome Analyzer II: high-throughput sequencer. Bioflux 1000: Automated microscopy workstation for time-lapse study of biofilm development under tightly controlled conditions of flow, temperature and incubation atmosphere.